Krusell produces cases and flip covers for most of the Nokia Lumia line, including the new Lumia 1320, Lumia 1520 and the Lumia 2520 tablet (such as the one shown above). Case colors include black, white, orange, green and pink; and their phone cases feature a credit card pocket, so you might even be able to ditch the wallet. Krusell accessories are available from multiple telecom providers, including: Orange France, Telia Sonera and Gigantti in Finland,Wellcomm in Indonesia, Saturn and Media Market in Germany, Media Markt in the Netherlands and from Teknikmagasinet in Sweden. Mozo produces a range of styles for their covers – from smooth to hard, as well as flip covers – for nearly all Lumia devices; and they also have a leather pouch that you can use to carry your phone in style. The featured image at the top is one of their cases for the Lumia 1520. 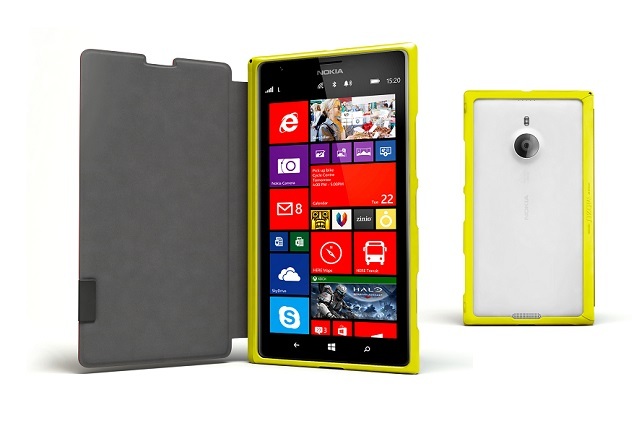 Below is their folding case for the Lumia 1320. Mozo products are available in many parts of the world, including: the Nordic countries, Russia, Central and Eastern Europe, India, Middle East and South Africa. In the United States, you can find Mozo products at Microsoft stores. OSM produces covers for the new lines of Nokia Asha phones (Asha 501, Asha 502, and Asha 503); and they are generally sold via Independent Retail shops (focused Asha outlets) and via KDR (organized trade) in IMEA. This company makes seriously durable cases for several Lumia phones, including the Lumia 610, Lumia 900, Lumia 920, and Lumia 820/822 (my daughter has one for her phone, and it has saved the device many times from accidental drops). Their cases are available in the United States via Best Buy, Walmart, Radio Shack, and Amazon.com. In the UK you can get them from Tesco. Pictured is their case for the Lumia 1020.